In the United States 1 in 3 births end in a cesarean section (c-section). The rate of ‘low risk’ or elective c-sections, where no obvious peril exits to the mother or baby, is now over 1 in 5. This procedure is considered major surgery and carries a price tag north of $15,000. With over 4 million babies born each year this practice costs the nation a staggering $20 billion dollars annually. It is worthwhile to review the data behind this ACOG statement. 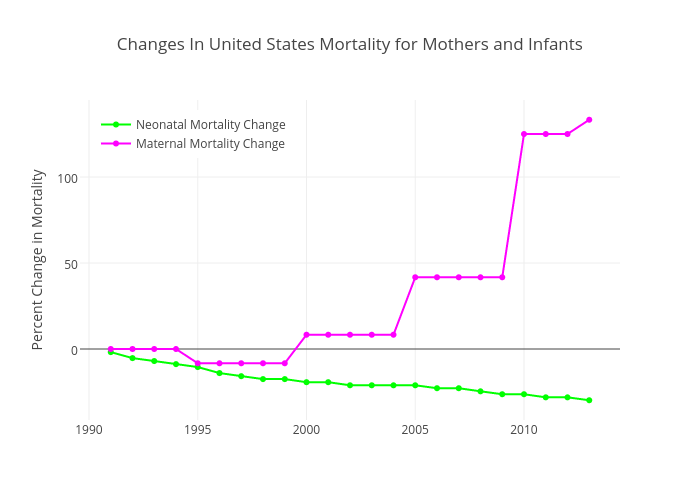 Over the same time-period, referenced above, maternal mortality rates (MMR-deaths of mothers) have doubled. On the other hand neonatality mortality rates (NMR-deaths of babies) have decreased about 30%. NMR is the rate of deaths of infants in the first month of life, which is not solely dependent on the birthing process. In fact, within the last two decades, advances in neonatal medical care have brought the fetal age of viability (pre birth) to as early as 22 weeks gestation. This is down from the 28 weeks assumed during the Row v. Wade decision in 1973. In other words increased life saving procedures, unrelated to how birth takes place, has increased babies likelihood of living. Another relevant data point is that he US has the highest 'day after birth' death rate in the developed world (source). As death rates go there is no clear evidence that the drastic increase in c-sections is doing any good, and may be doing some marginal harm to mothers. We can make one consideration regarding birth as it relates to it's natural danger. The birthing process is inherently life threatening. An important question to ask is; how dangerous is birth to the mother and infant if left to nature alone, without any medical intervention? The answer to this question should directly inform the rate of c-sections, and address the considerations of those who believe purely natural methods are the safest approach. One way to find a natural death rate for childbirth is to look at MMR and NMR worldwide. Cultural differences exist that allow for the observation of a natural ‘baseline’ where access to medical care is largely unavailable. The following maps show MMR and NMR by country around the world. The worst places in the world to give birth are in sub-Saharan Africa. The largest MMR rate belongs to Sierra Leon at 1.1% and the largest NMR is Angola at 4.6%. Combined (if assumed independent) a natural baseline of birth related deaths is roughly 6%. This is a small rate, to be sure, but certainly nothing you would want to leave to chance. While the death rate is around 6% there is also an injury rate that needs to be considered as well. The injury rate in 2002 was roughly 1% (source) giving a combined rate around 7% for negative birth related outcomes. However, in the United States some areas have c-section rates at or above 30-40%. This is not justified by natural risk. The highest c-section rate in the US is a tie between two Texas counties and Miami-Dade in Florida at a whopping 49%. The lowest rate belongs to Santa Fe county in New Mexico where only 18% of births end in c-section. It is clear that some areas are pulling the national average up. Here is a comparison of select US county rates against other metrics of interest (NMR, MMR and other countries). As you can see, we have five counties in the US that have higher c-section rates than Brazil, the country that holds the top spot globally. Not a single county reports a lower rate than Sweden. In addition most county rates greatly exceed the natural baselines in Africa and even greatly surpass the MMR from the 1700's (pre germ theory), the most dangerous time to give birth in human history (source). To be clear, I am not stating that c-sections are inherently bad. In fact, it should be obvious to anyone that many legitimate (critical) medical reasons exist to conduct them. However, if the goal is to limit the financial and physical burden on new mothers the data seems to show, simply, that we are doing too many of them. What that means for an individual, or even the country, I'll leave up to the medical profession to decide. However, based on recent publications even the ACOG seems to agree.